Help solve your gardening problem. Here are the answers to some commonly asked gardening questions about shrubs with hints, tips and advice. I never know which shrubs I can prune and when. Can you give me some advice? 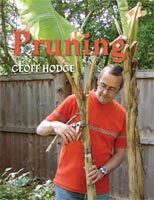 The best advice I can give is to recommend you buy a copy of my book on pruning! It's very reasonably priced and contains details on how to prune just about any plant you'll have growing in the garden. Can you recommend shrubs for a cold, windy garden? The following shrubs are generally suitable for cold, windy sites. But also be aware that the wind will dry out the soil and put these plants under stress, so make sure they are planted well in well-prepared soil with plenty of organic matter and watered while establishing during windy or dry periods. Calluna; Cornus alba; Cotinus coggygria; Elaeagnus commutata; Euonymus fortunei; Gaultheria; Hippophae rhamnoides; Hydrangea paniculata; Kalmia; Kerria; Leucothoe fontanesiana; Lonicera pileata; Mahonia aquifolium; Pachysandra terminalis; Philadelphus; Prunus spinosa; Rhododendron; Salix; Spiraea; Tamarix; Ulex; Viburnum opulus. A lot depends on where this browning is occurring. If it’s only on the lower/older leaves then this is perfectly natural – as the leaves age they turn brown and die and can carefully be pulled off the plant when totally dead. However, if it’s all the leaves – including the youngest right at the tip, then this indicates a problem. It is most likely that the plant suffered damage in the winter from cold wind, frost or low temperatures (cordylines are not 100% hardy). This could be coupled with winter wet/waterlogging as cordylines prefer well-drained soil. The leaves on my Japanese maple (Acer palmatum) are drying/break on the ends. What's wrong? Japanese maples are very fussy creatures - and can be difficult to look after unless you give them the right conditions. Positioning is important as they don't like strong sun, deep shade, frost, cold winds or very wet or very dry soils! So the position/care may be wrong. If the plant is growing in a container then it could be a lack of food &/or drying out or waterlogging - the symptoms are similar. How can I tell if my shrubs are actually dead? During winter they look so lifeless and I find it impossible to tell if they've been killed by frost. The acid test is to carefully scratch the bark of one or more of the branches. If they're green below then all's OK. If it's brown underneath then I'm afraid that branch is dead. Start scratching at the tips of the branches and move nearer the main stem and see if any of the branches/stems are alive. Once you reach live, green material, you can prune off whatever is actually dead. We have a large, mature Prunus lusitanica that has been dropping yellowing leaves for approximately six months. Although the plant itself looks healthy and new buds are on the way, we are worried. This could be due to a number of things. First, if it’s just the older, lower leaves and it’s slow and gradual rather than all in one go, then this is quite natural – even evergreens drop their oldest leaves. If it’s more than this then it could be that the plant is under stress – overly dry or overly wet soil would be the usual suspect – wet/waterlogged soil would be more likely to cause excess leaf drop. It could be that the plant is suffering from mildew disease – grey/white patches on the leaves – also made worse by dry soil, so water well and mulch the soil. Or it could be suffering from phytophthora root rot disease – made worse by wet/waterlogged soil. It’s impossible to see if this is present externally; you would have to cut through major stems/branches to look for a black ring. When is the best time to prune lavender? I've been given varying advice. The best time to prune lavenders is immediately after flowering. Simply trim over them with shears to remove the old flower spikes and a little of the foliage below. Always shear them to a compact, rounded shape. The other time that you can prune your plants is in April; in fact, this is the best time for tender lavenders, such as Lavandula stoechas. This can delay flowering but is often a better bet in cold regions on late flowering plants. Pruning in these circumstances after flowering can cause problems because the wounds may not heal over enough before the onset of cold weather. After pruning it's a good idea to give your plants a light dressing of sulphate of potash to toughen them up and improve the following year's flowers. Never prune back lavenders into old wood. The plants rarely re-shoot and more often than not will die back. How should I prune my lavatera bushes? Lavateras grow like mad and need annual pruning to keep them within bounds. This should be done in April and involves reducing all the previous year's growth back to an inch or so long. If you live in a windy site it is worth tipping back the plant in the autumn to reduce wind rock; this means in practice pruning back shoots by about one-third. I have two dwarf lilac bushes growing in tubs. They are about five feet tall and I don't want them to grow any taller. When and how should I prune them? They flowered very poorly this year despite feeding them. Also, they showed signs of rust! Can you help me and the lilacs? They're in a shady spot. First, lilacs prefer a sunny spot - so the plants may not be getting enough light, hence the poor flowering. Pruning consists of removing old wood immediately after flowering. Pinching back other shoots at the same time will help encourage a bushy shape. Lilacs don't suffer from rust, but do get attacked by various leaf spot diseases. Spray the young foliage in spring to protect them, with a suitable fungicide - such as Fungus Fighter or FungusClear. I've noticed that the leaves on our photinia bushes are covered with dark spots. This has happened in previous winters. Is it serious? From your description it sounds like a fungal leafspot disease. Usually these are only disfiguring and rarely affect the overall health of the plant. However, they are usually a symptom that the plant is stressed and may be suffering from some other problem - probably physiological, and may be something as simple as drought or waterlogging, cold or wind damage. Spraying with a general fungicide, such as Fungus Fighter or FungusClear, will help protect new growth from getting the marks, but you should try and work out why it is stressed. Several of my newly-planted shrubs look as if they are suffering from drought damage, but I water them regularly. Shrubs that are planted in late spring or summer often struggle to establish because of the demands put on the roots by the warm weather. That's why planting in autumn or early spring gives the best results. This problem is made worse if the plants were at all potbound and you didn't tease out the roots from the rootball. In such circumstances, even regular watering may not help. And watering little and often stops the roots from venturing out of the rootball and into the surrounding soil. A thorough soaking once a week will give better results. If your plants don't improve by the autumn, it may help to cut them back by up to one-third to reduce the stress on the roots which will then hopefully establish better during the autumn and winter. If this doesn't help it may pay to lift the plants before spring to check on the roots and tease out those that are still rootbound. Depending on the plants concerned, the cutting back may prevent flowering that year, but that's not such a bad thing as again the plants will establish better without flowering. I've started collecting agaves, phormiums and other exotic shrubs, which I'm growing in pots. Can you give me some advice on keeping them in tip-top condition? All these plants are perfect for providing a tropical effect to the patio. Keep the compost moist through the summer, but reduce watering in late autumn and winter as the plants stop growing. Such plants aren't completely hardy, and growing them in pots will make them even more susceptible to frost damage - the roots are more prone to being killed by the cold as they don't have as much insulation as they would if the plants were in the ground. So you're first priority will be to give them some protection. The best way is to move the pots into a frost-free greenhouse or conservatory. If you can't do that move them to the shelter of a south-facing wall and protect the pots from frost damage. You could do this by wrapping insulation around the pots in the form of polystyrene chips, roof lagging or similar; hold the lagging in place by using it to fill plastic bag 'duvets'. A layer or two of fleece draped over the plants and secured around the pots will help give more protection. I'd like to grow a Japanese maple in a pot. Have you any advice for getting the best from it? Japanese maples make perfect subjects for growing in pots providing you take a few precautions. Make sure you use a loam-based compost such as John Innes No 3, and use a terracotta or stone pot; plastic ones don't provide enough root insulation in winter and can get too hot in summer causing the roots to scorch. Japanese maples are very fussy and need precise conditions so make sure the pot is placed somewhere out of hot direct sun, cold winds and frost pockets. In the winter move the pot against the protection of a wall to help prevent the roots from freezing, and even protect the pot against severe frost by surrounding it with polystyrene chips or similar insulation and covering this with bubble wrap to give further protection. If you live in an area where the tap water is hard (chalky/alkaline), then you will either need to water with rainwater &/or use sulphur chips to help acidify the compost. Sulphur chips are available from Greenacres Direct. My standard trained Salix integra 'Hakuro-nishiki' has one side with bare woody branches and it has lost its umbrella shape. What has gone wrong? These plants have become very popular in recent years, but they don't always thrive. Sometimes the graft union (where the top is grafted to the stem) tends to be weak and all or part of the head dies back, but also they are not completely tough and may suffer from frost or cold wind damage. The side of your plant that is still growing well may has received some protection from these, whereas the dead portion may be more exposed to the elements. Sadly, there isn't a lot you can do, apart from hope that the undamaged branches will grow back to hide or disguise the damaged portion. Pruning back the branches in spring may encourage re-growth which you may be able to train to hide the damaged area. This winter you should ensure there is plenty of protection from frost or cold wind - covering the top with fleece will certainly help. I have to move some established plants in my garden. Can you suggest the best time to do it? Deciduous plants which drop their leaves in autumn can be moved when they are dormant - any time from November to March providing the soil isn't frozen or waterlogged; the earlier the better. Evergreens are best moved in September/October or March/April. It's always a good idea to prune the plants back before moving them to reduce some of the strain on the roots; depending on when the plants flower this may reduce flowering next year. Make sure you prepare the new site thoroughly before moving the plants, digging in plenty of well-rotted manure or compost, and thoroughly water the plant before you lift it. Water in well after moving and keep the plants well watered all through next year. Why did the leaves of my skimmia turn yellow and drop off? Skimmias are sometimes described as being a bit 'miffy' which means they sometimes fail for no explicable reason. They prefer a neutral to acid soil, although they will often grow well in fairly alkaline soils providing it is a good, deep soil. They don't like to be grown in full sun - preferring some protection from hot, direct sunlight. They also like a soil that doesn't dry out and one which doesn't become waterlogged. The other reason could be a problem with the roots - such as an attack from vine weevil grubs or one of several root diseases. What is the best way to keep a container-grown cordyline palm during the winter? It is important to protect the growing point of your palm. The easiest way to do this is to gather all the leaves together and then hold them in an upright position with string. During very cold weather further protection with sacking or fleece wrapped around the foliage may be needed to prevent frost getting to the growing point. During mild periods the protection should be removed to help the leaves breathe and stop them from rotting. The roots will also need protection from severe frost, so either move the plant into a frost-free building or wrap the pot with sacking or roof insulation material or similar wrapped in plastic to keep it dry. I have a large, well-established ceanothus that is too big for its situation. What is the best way of moving it? Plants that size are too large and mature to move with any real chance of success. It would take a long time to settle down and establish - if it ever did - and would never look really healthy again. Your best solution would be to prune the plant - most ceanothus will re-shoot even after fairly hard pruning. The time to prune will depend on when it flowers; spring-flowering ceanothus are pruned immediately after flowering, whereas autumn-flowering varieties are pruned in spring - after any threat of severe frost. Why do I get so few berries on my wall-trained pyracantha, and why do they then turn black? The lack of berries on your pyracantha could be caused by one or more of the following factors. The plant may be young and is still getting established. The wall will make the soil very dry, so the roots are also too dry, and this also causes potash - the nutrient responsible for flowering and fruiting - to become 'locked up' in the soil and not available to the plants. Last, if you are pruning at the wrong time you may be cutting off the flowering shoots; pruning is best carried out once the flowers have faded, removing shoots without developing berries. Blackening of the berries is due to a fungal disease called pyracantha scab. You should prune out affected fruit and stems, and then spray with a recommended fungicide. Why have my rhododendron and pieris died? We have a clay soil. Plants which totally fail to establish and then die usually do so because of a problem at the roots. Both plants are shallow rooted and very prone to drying out. Ensuring the soil is kept moist for the first year and mulched with around 10cm (4in) of bark chippings will help improve establishment. Although they like to grow in moist soil they do not like to be grown in waterlogged soil. It could be that your heavy clay soil doesn't drain very well and the roots sit in a sump of water. Always dig over an area of around 1 sq m (1 sq yd), removing any compacted clay pans and improving drainage with plenty of compost or leafmould before planting. If neither of these conditions are to blame then a root-eating pest may be to blame. Vine weevil larvae are the most common culprit, so lift the plants and look for the tell-tale C-shaped white grubs. Why haven't my hydrangeas flowered? There are a number of possible reasons why your hydrangeas haven't flowered. First, if these are growing outside (and I presume they are) you may have indoor or florists' hydrangeas. These are not hardy and are only suited to indoor culture. Obviously, if you bought them from the outdoor section of a garden centre or nursery then they would be outdoor types. The variety name will also give an indication. Second, they may be planted in a frost pocket or very cold position. A number of hydrangeas have been blind over the past few years because of late frosts killing the flower buds. Third, the plants may be too dry. Hydra means water, and hydrangeas need plenty of moisture at the roots to grow and flower. Fourth, if you are pruning the plants then you may be removing the flower buds which are formed the previous year. Pruning involves removing just the dead growth and faded flower heads in April just back to the topmost pair of leaf buds - which is where the flower buds are. Fifth, the soil may have a nutrient imbalance and be low in potash. A feed of sulphate of potash now and again in march will help enormously. What is the best way to grow rhododendrons and azaleas? Azaleas are species of rhododendrons, so both are cared for in roughly the same way. They need lime-free soil or compost; if your soil is alkaline they can be grown in pots of ericaceous compost. The soil also needs to be rich in humus - leafmould is best - moisture retentive, but not soaking in winter. Generally, they prefer a site that is part shaded, and one that is especially out of hot, direct sunlight. In summer you must make sure they don't dry out at the roots or they won't set flower buds for the following year. Feed in spring with a balanced fertiliser then again in summer with a high potash one. Usually no pruning is needed but tall shoots can be cut back immediately after flowering if they are getting too large. We have two holly trees, one male, one female, waiting to be planted. How far apart should they be? The distance apart isn't critical, but does depend on the varieties (how tall they grow) and whether the site is cold and windy. Generally speaking I would add the ultimate height of the two hollies and divide by two to get the distance. So if they both grow to 3.6m (12ft) high they should be planted 3.6m (12ft) apart. But you don't need to be this accurate. What is the best way to propagate rhododendrons? It is possible to take cuttings from rhododendrons but they are not easy to root. Your best bet would be to layer the plant. Choose a supple branch low down on the plant which is possible to pull down to the ground. Make a shallow slanting cut through the bark on the underside where it touches the ground, wedge the cut open with a match or similar and apply hormone rooting powder to the cut. Peg the shoot into a small pot of ericaceous compost or peat and sand mix which has been sunk into the ground. Weigh the branch down with a pebble or small stone. It may take six months to root but it is more successful than cuttings. I have a Cornus kousa planted in well drained slightly acid soil and in full sun. Each year the leaves turn brown at the tips and the brown, dry, zone eventually spreads to half the leaf. I should be grateful for your comments on possible causes. The symptoms sound like drying out. It could be that the soil is too well drained, or the shrub is receiving too much direct sun or that it is in an area which gets a lot of cold, drying winds. Although, in practice, it is usually a combination of such factors which causes the leaf browning. I'll have to leave it to you to decide which one(s) is/are to blame. We have just acquired a plant, skimmia "chillean choice". No-one seems to be able to tell us anything about it. Can you tell us so we can provide it with a good home? The correct name for your plant is S. japonica reevesiana 'Chilan Choice'. Like all skimmias it would prefer a position in light/dappled shade and a lime-free soil. It will grow to around 90cm (3ft) tall. It is a hermaphrodite form - possessing both male and female flowers so it will set some berries by itself, but would set more if it had a male partner. It's other attraction is the pinky/crimson back of the leaves. Some time ago I bought a shrub called 'Sydney Wattling'. Having moved house I'm desperate to buy some more of these for the new garden - but no-one seems to have heard of them. Any ideas where I can buy them from? There isn't a plant by the name of Sydney Wattling. It might be a variety of a plant - but again I've never heard of it and I'd have to look through around 80,000 plant names to find it! It could be you're thinking of the Sydney Wattle. The acacias are commonly called wattles and they do come from Australia, although again there isn't one commonly called the Sydney Wattle, although there is one called the Sydney Golden Wattle - Acacia longifolia. I bought a Leucothoe 'Scarletta' and would like some information about this plant. I planted it in partial shade and the pH of my soil must be around 6. At the moment the leaves are green with red tips and I want to turn it all red. Should I feed it with an ericaceous compost or do I have to move it to a place with more light? Leucothoes prefer a position in partial shade, so the position is fine. The soil is acid as well, so there's no need to go overboard with the ericaceous slant. A good feed in spring with a granular rhododendron fertiliser will be enough. The colouring of the leaves only comes about with a significant drop in temperature. As yet, we haven't had enough really good cold days over a long enough period to bring out the best in the foliage. Also, it's still quite young and finding its feet. Once it is better established (next winter) it will give a much better display. I only started gardening a few years ago, and have much more to learn. One thing I find a little confusing is when jobs should be done in the garden, the reason being I live in the west of Scotland (by Kilmarnock, 10 miles north of Ayr on the coast). Having checked your Garden Answers section on the best time to move shrubs (advice for deciduous-leaved shrubs is 'between November and March providing the soil isn't frozen or waterlogged'), I really don't know what to do. So far, since the beginning of October, our weather has either been soaking wet or frozen. I have two established hydrangeas (which came with the house) but they have far outgrown their planting position, and even if pruned would outgrow their position again within a matter of years. Any advice on when would be the best time for me to move them, considering the weather I get? The west of Scotland is actually quite mild (honest!!!) compared to other parts of Scotland. Although the weather has been wet and freezing, I'm sure the soil itself isn't actually waterlogged (if you dig a hole, does it fill up with water? ), and if it is you should do something about it so that it isn't! And, I'm sure the soil isn't frozen either. A little light frost on the surface is different to a soil which is frozen solid and comes up in lumps which can't be broken up because the water particles have frozen together solid. So that means, you should be able to move the plants now. If I'm wrong then I would wait until March/early April. Before moving plants, it's always a good idea to prune back the stems by about one-third to take the stress off the roots. But, if you do this with a hydrangea, you will be cutting off next year's flower buds. Large, established plants are always more tricky to move, so I would be tempted to prune anyway and forego next year's flowers. The other option is to prune back half of the stems and leave the other half so you get some display next year.